Many people, especially parents of young children, ask about moisture protection for their new organic mattress. The option that we have is called a wool moisture pad. It is made of tightly woven wool and is moisture resistant. If you sprinkle or pour water on the fabric, water beads up, like it would on wax. 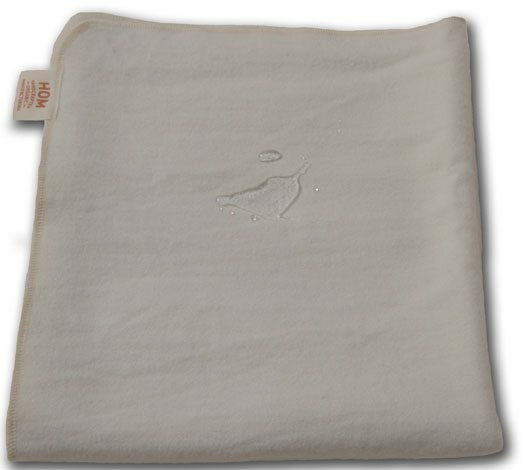 The wool moisture pad works great in the case of leaky diapers, to prevent against a mattress getting wet. However, many parents want to know if this is a 100% waterproof option for a full accident. It is not 100% waterproof, but there are things that you can do to ensure it works well. First, it is important to layer a cotton mattress pad on top of the wool moisture pad. What you would see, after you pour water on the wool moisture pad, is that at first the water beads up, but after a while, the water would eventually leak through. However, when you layer a cotton mattress pad on top, the moisture is absorbed into the cotton and isn’t puddled up on the wool moisture pad. This seems to be very effective in keeping moisture from soaking through the pad and into the mattress. If you find an accident, all you have to do is wash the cotton mattress pad, as you will find the wool moisture pad and the mattress underneath to be dry. The second thing you can do to ensure its effectiveness is to not to let moisture sit for an extended period of time on your wool moisture pad, even if you are using a cotton mattress pad. When my daughter was potty training, she would typically wake up when she wet the bed. This is the ideal situation, so that you can remove the wet sheets and cotton mattress pad right away. I used this product for years, and absolutely love it! Even after many accidents, her mattress never got wet.